A golden start, can we have that? Let’s be honest. Doing a 365 is not for the faint of heart. I have been so nervous about it for a long time now, because to me it’s a big commitment to my art practice. I want to do it but I also feel fear and hesitation at times. I tend to slack of when I don’t have clear deadlines and outer accountability (as in posting to my blog about it). I’m definitely an upholder in that way. But once I decided to give it another try this year, I was all in. There’s no looking back now, so I decided to go have a wonderful and golden start to the year! But I know that I need to begin to find my way forward, so that’s what I did. It’s okay to feel antsy and like you don’t know anything. Just start creating something… So I sat one day at my desk and brought out the box of square target practice card-stock papers, and lay out seven of them in front of me. On my desk I had a white tissue paper with gold dots on, so I grabbed that for my first collage, and that became the theme of the week. 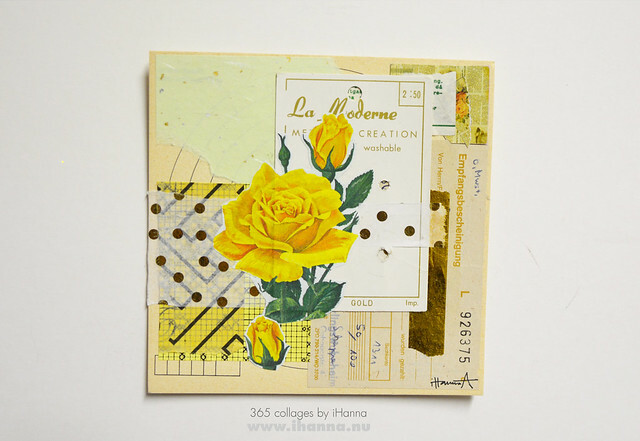 Golden Polka dots, and some other gold papers in some of the collages too. The yellowed vintage look of these target-practice-papers, that I bought a few years ago at a flea market, lends themselves perfect to the “vintage feel” collage style, so I went for that. I’m sure other weeks these will explode with colors, but I started in a subdued and tranquil way, feeling my way forward. I didn’t have to cut anything out. I just brought out my collage inbox that is a total mess right now, and picked out what I thought went together. Even a piece of fabric went into the mix, because it was in there. I don’t know if I have enough papers to make 365 collages in the same style, because I haven’t counted, but I know there is enough for right now. To get started, to keep going without stopping. A few of the target practice papers are smaller and not square. I might use them later, cutting them down to smaller squares or using them as-is. Although I love the ideas of all collages being the same size of course. I think I got in happy mail once, or maybe it was tucked into the pack of 1960-letters I found at a flea market a few years ago. 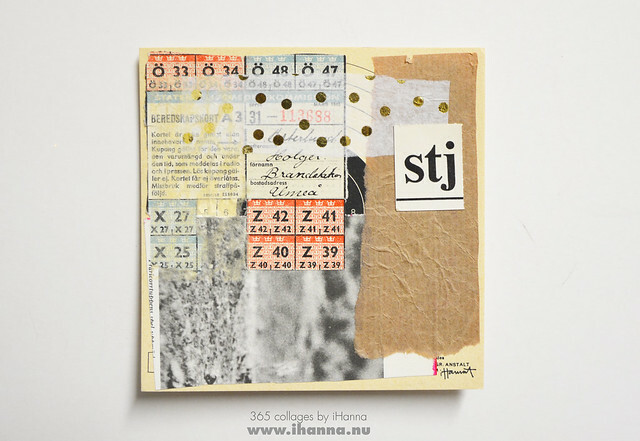 I rarely even see ephemera for sale here in Sweden, but those letters I’m still using here and there in collage. I love hand-written bits as backdrops. I could say so much more about this project, my feelings about starting, and each one of these collages, but I’ll stop here. I want to know what you think of them. Please let me know below how your creative year started, and which one of these you like most – and why? Give me some feedback – that will encourage me to keep going. If you don’t know where or how to get started I recommend sorting for inspiration or filling a few small notebook pages in your scrap notebook to warm up before you jump in to the creative activity you feel most drawn to right now. 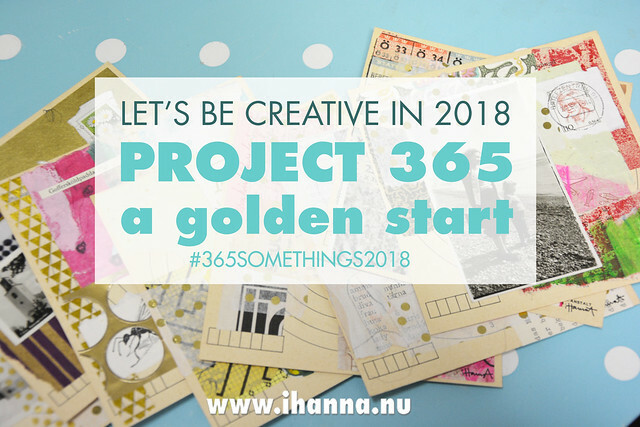 Not mentioned in the resources yesterday, but updated now: You can use the hashtag #365somethings2018 on Facebook, Twitter, and anywhere else. If you’re more on Facebook than Instagram, a good place to share your artwork daily is Tammy’s art group – join the Daisy Yellow Group. I’m doing this along with Tammy and her week 1 is up and a bunch of other’s (listed here). Also follow the growing Pinterest Board 365 Somethings to see what other’s are doing there. Thanks for tagging along on my creative journey, and sharing yours with me below. 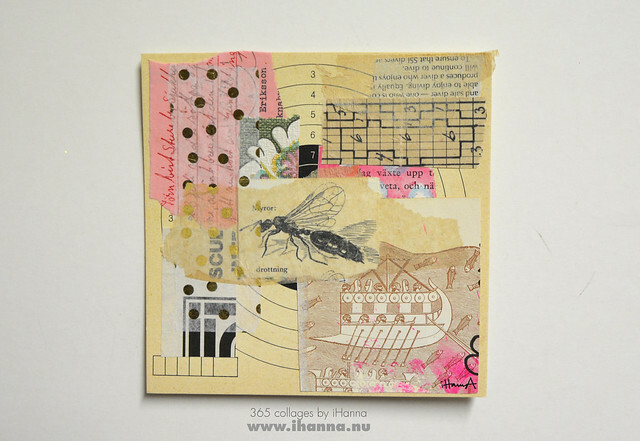 Feel free to also check out 365 collages week 1 in 2013. This entry was posted in Art Experiments, Collage and tagged 365in2018, vintage. Bookmark the permalink. I understand about the nervousness. I have wondered how I can create 365 pieces, but just a week into this project I feel some artistic sense coming back to life. The best thing is it is more about Playing than creating “Art”. I think I see some play in your collages too. My favorite is “Feeling Antsy” and also “Fire and Stars”. It’s a subtle & beautiful color palette and those two compositions make my eyes travel all over the card to look at the details. They remind me of some of your early ATC’s. 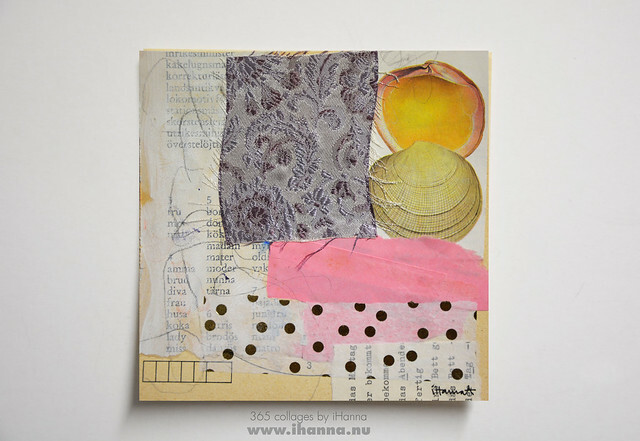 Gorgeous collages, Hanna. My favourite is the yellow rose one! It’s subtle, yet bright; it’s modern, yet vintage. It’s geometrical, yet has curves. I love it. Love them all, but my favorites are Feeling Antsy and Trip to mom’s place. Was surprised to hear you don’t see ephemera much for sale in Sweden, and I wondered why that was the case. Hanna, these collages are all lovely! I hesitated until the last minute to join in but already I’m very glad to be on board. I found this weekend I just wanted to create (which I did). Back to work for the week I keep daydreaming of what my daily ‘heart’ will look like and what I can accomplish next weekend. Thanks again for kick-starting the creative year with this great project! glad to see how week one went. I joined in and created 11 postcards the first week. I had thought I would do one a day, but so far it has been 2 or 3 at once then missing a day..not sure what I think about that. Love all of yours- if I had to choose one it would be the mum and daughter..because it is evocative of my childhood. Your collages are inspiring. I would like to jump in and already have in a small way by doing Drawriotdaily each day for the past 11 days. But, I do not know if that will be my project for 365-more-somethings-2018. Could it be to simply create each day … whether it is with paper & paint/pen, etc or knitting? Or is part of the purpose to have 365 pages. I just adore your colages and if I must pick one I’d pick no.5 because I seem to be drawn to that sweet image. I think I only realize now what a huge challenge I’ve taken up for this year, wow, exciting!!! My fave is #3 feeling antsy…..I like the subtle colors and a dash of pink, the organic nature, various shapes, sizes, and text !!! I’m also doing collages, Hanna, but mine are a far cry from yours. I am in awe of your art, and absolutely LOVE everything you created this week. Although I thought I had a lot of fodder, I see mine pales to what you have. You have a real gift for putting art together that I probably would never think went together. You do collage very, very well. I understand your concern, and I wonder if I have bitten off more than I can chew, since I post every day. I have made it through my second week, and have shown my collages on my blog. Unfortunately, I’m not on any social media site, except blogger, so I can’t share my art with anyone who doesn’t visit my blog. Thanks for stopping by yesterday. BTW, I post my collages every Monday that I have created the previous week. Thank you for hosting this event.